This is the collection of papers on college education presented by me at various national and international conferences. 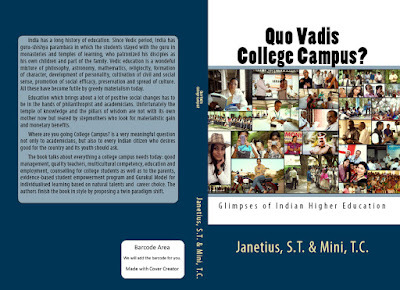 Quo Vadis College Campus? is a very meaningful question today. In this modern day of technological development, running an institution in an unscientific authoritarian business model will not produce any desired result and quality. Business models which blindly imitate Western corporate culture and propagate them into an educational system may not fetch optimal quality outcome unless and otherwise it is suitably knitted and properly fit into the local educational system. Besides presenting a status quo of Indian education industry, the book presents various innovative models to enhance teaching-learning, classroom management, curriculum preparation and wellbeing of students in the campus. The authors make the readers reflect Quo Vadis College Campus?